Create upto 4GB ramdisk . Make sure you have 4GB or higher RAM before using Dataram. Enter the size of ramdisk in MegaBytes. Enter the Label for ramdisk. Select location where ramdisk will be saved. Create Ramdisk that would not be saved in hard disk. The data in ramdisk will be deleted when system shutdown. SoftPerfect RAM Disk is a free high-performance RAM disk application that lets you have a disk on your computer entirely stored in its memory. As the memory is much faster than physical hard disks, storing temporary data on a fast in-memory disk achieves a higher performance. Whatever your job is, read on to find out what a RAM disk can offer you. 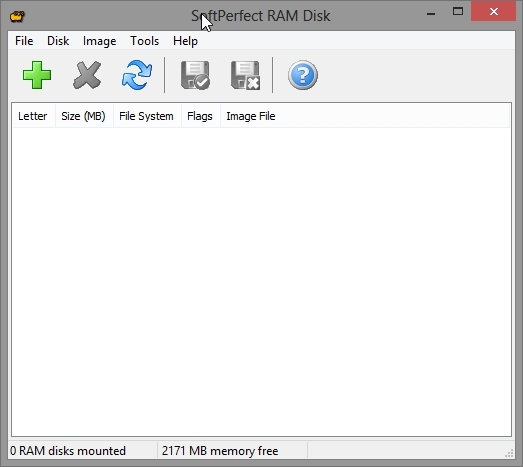 SoftPerfect RAM Disk creates a virtual disk residing in the computer RAM accessible in Windows Explorer and other applications, allowing you to store any temporary information on this disk. Furthermore, Windows can be configured to use the RAM disk for temporary files, so that the system and most applications would use the fast in-memory disk for their temporary data. As Windows and other third-party applications often create a large number of temporary files for a short time only, using a RAM disk will extend your hard disk’s life by sparing it from excessive reading and writing. 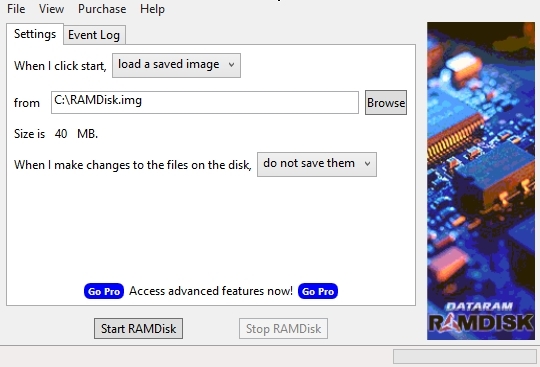 To do so first you have to create an image file on the hard disk which will be used to save data of ramdisk at shutdown and then to restore the data in ramdisk during computer startup. To create the image file select “Image->Create Image“. Tick “Save contents to associated image every, min” and set it to “30” minutes. If you are using Ramdisk of some critical work then you need to set it to 5 minutes or less. This is the main interface of SoftPerfect RAMDisk. Size in MB lets you select the size of ramdisk. Here I have set the size to 600 MB. Here you can customize the “Volume Label” of ramdisk drive. In this case “RAMDISK VOLATILE AT BOOT“. Select the size of the image file in MB, which will the size of Ramdisk. In this case, it is 1000 MB. When you change the contents of Mounted ramdisk then it may be saved automatically after a certain interval if you have done such settings. This tweak will definitely improve the browsing speed of Firefox browser. First you need to install a ramdisk software. Select a directory where you want to create the image file. Select size of image file ( Ramdisk ) . Here i set it to 800 MB. You can create a smaller or larger size RAMDISK depending on the size of installed RAM in your computer. Set time to “30” min, as shown below. Click the “I’ll be careful I promise“ button. Right click anywhere in the values in the lower portion of the screen and choose New -> String. Type in “Z:\Firefox Cache” in the “string value” . Z: drive is the location of RAMDISK in my computer. You may have different ramdisk location. So you need to enter the location of ramdisk . Right click on “Browser.cache.disk.capacity” and select “Modify“. Here you will enter the size of cache that Firefox will use in ramdisk. Enter the size of Firefox cache in Kilobytes. It must be smaller than the size of Ramdisk so that firefox cache does not fill the whole ramdisk. I created a Ramdisk of size 800MB. So i want the Firefox cache size of 600 MB = 614400 KB. That’s it. Now all browser cache from Firefox will go to the RamDrive. Open “Control Panel-> Internet Options“. Set the “Disk space to use” to 600 MB . You can set the internet explorer temporary internet files size more or less than 600 MB depending on the size of RAM installed in the computer. Select the RAMDISK drive. In my case it is Z: drive.